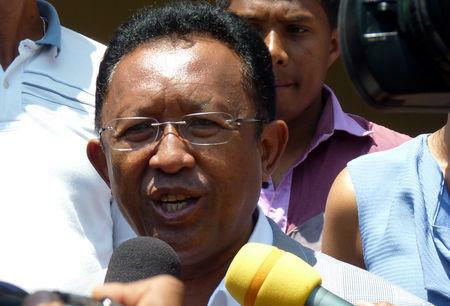 ANTANANARIVO (Reuters) - Madagascar's president, Hery Rajaonarimampianina, conceded defeat in his bid for a second term after managing a distant third in the first round of voting in the island's presidential vote. Rajaonarimampianina got just 8.82 percent in the November first round, the High Constitutional Court said on Wednesday, behind former presidents Marc Ravalomanana, who got 35.35 percent, and Andry Rajoelina, who got 39.23 percent. He will not take part in the second round, due on Dec. 19. The court rejected his request to have the election cancelled. "The people’s choice must be respected," Rajaonarimampianina said in a televised statement late on Friday. "If this is not respected, the authorities that will come after will not be stable." Madagascar is hoping for a second peaceful election since upheaval in 2009, when Ravalomanana was forced out of office by protests led by Rajoelina in what the African Union and other international organisations said was a coup. Total voter turnout was 53.95 percent of registered voters. Rajaonarimampianina said he would not endorse any of the remaining candidates and appealed for calm. "I wish that this second round will bring peace and stability to our country," he said. "We have all seen the irregularities during the first round. The Malagasy (people) hope that this will not happen during the second round."